Fashion today is as liberal as it never was. It allows you to project your personality and showcase your thoughts in the simplest way possible. These days there are less rules on what to wear and what to wear it with. One can really put on anything with another thing which, if pulled off 10 years ago, might be a hideous combination - but today, a personal work of art. Fashionably speaking, freedom of expression at its best. I could not help but think that when putting together this outfit: a semi Hawaiian shirt (gifted by Devotee Co) over a dress with tulle skirt. And a pair of sneakers. Wear this in my mom's generation and you would be the laugh of the town. In contrast, I felt so good wearing this today as it captures all my mood; something fun, something sweet, something energetic and active. Devotee Co is holding an up to 50% sale until February 12! Check out their Facebook page or tab in Berrybenka. A fashion showcase colored up the southern region Jakarta last weekend; Next Level Indonesia. From, for, and by Indonesian youth. Honored I was to be invited, and my attendance signifies my sincere celebration of Indonesia's fashion industry. Cheers to the youths whom Indonesia should be proud of! For more photos of the fashion show, refer to my Facebook here. Such a cute outfit! love your bag. You are so pretty! Your dress is really cute! You're right, we are much more free now to wear what we want and to mix clothes and styles the way we want to. This is such a beautiful post and I absolutely love your bag! Adorable outfit! You look so pretty! That event must have been awesome! I hope you had fun! I love your shirt, so cute! And the buttons! And the dog, even though he isn't on the shirt. 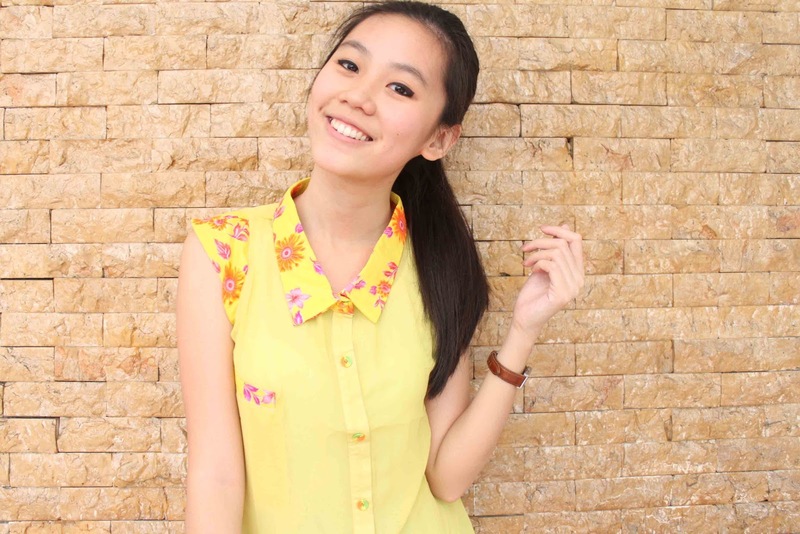 Ohmigoodness, that yellow top with the floral print at the top is just adorable! I love your simple and chic style! would you like to take a peek on my blog? I love your blouse and you look super cute! Are those flowered buttons? I really like the flowered accents, the print would be a bit much all over, but the touches are nice! fabulous outfit!! :""> you're so cute! and ( of course ) you are always pretty !!! You look very pretty. ;) Love your top! Yellow is an absolutely stunning color! Super army wedge sneakers are shown online, if you are ladies, get one and wear them! These text loans no fees are basically unsecured loans. As being what is indicated, the credit checks under these loans are wiped out consequently permitting bad or low credit scorers to effectively profit from these loans. Likewise this implies that no issue including late installments, defaults, unfulfilled obligations, liquidations, CCJs or IVAs remain as obstructions under these particular loans. They are likewise free from pledges that do no oblige borrowers to promise any resources against the sum being guaranteed. The reimbursement issues are additionally extremely basic while being movable according to inclination and comfort of the borrowers. These money are additionally liberated to be utilized for any reason and does not includes any kind of confinements.